Dave Douglas’s electro-acoustic quartet HIGH RISK offered a dynamic, edgy and intense set at Performance Works (in Vancouver) yesterday evening. Fusing layered, pulse-driven techno with Douglas’s Freddie-Keppard-meets-Freddie-Hubbard, fiercely clarion trumpet lines, HIGH RISK collectively muster an infectiously celebratory and powerful improvised music that’s as danceable as it is creatively provocative. While Douglas has composed a seven-tune repertoire for this new band – which recorded together for the first time on October 10, 2014, in Brooklyn, a session that resulted in their just-released CD on Douglas’s Greenleaf label – and while each member of the ensemble (Douglas on trumpet, Jonathan Maron on electric bass, Mark Guiliana on drums and Shigeto on electronics) contributes heavily to the collaboration, for me the group concept seems to rest on the innovative, wonderfully fractured loops, samples and laptop conjurations of Shigeto, who bopped, leapt and shimmied with joyful abandon behind a tabletop covered in rheostat boxes and circuitry. The sound palette and rhythmic patter he managed to conjure never obscured its synthetic origins but managed amid the electronica to engender a vibrantly zoetic feel: amazing, richly affective sonorities. At one point, he played in duo with Douglas and the intricate immediacy of his approach became apparent, as he built vibrant whorls and cascades of joyful noise. Mark Guiliana’s drumming is brilliantly propulsive, deep in the pocket yet consistently pushing forward; his multidirectional, quickly syncopated incisions through a four-on-the-floor backbeat were nothing short of genius. Jonathan Maron seemed to remain calm and steady throughout the concert, but his bass-lines – by turns warmly lyrical and darkly palpitating – kept the band centred and present. Early in their set, I thought I heard echoes of the bluesy melody of Miles Davis’s “Jean Pierre,” and Douglas definitely quoted the four-note tag from the Miles Davis-John Scofield line “That’s What Happened”: in some ways, HIGH RISK makes a music that might have emerged from Davis’s more progressive or edgy moments in his later years. But this is a music that’s of its own present tense. Some of the most powerful and moving moments came during the last tune, “Cardinals,” an elegiac homage Douglas dedicated to the memory of Michael Brown. 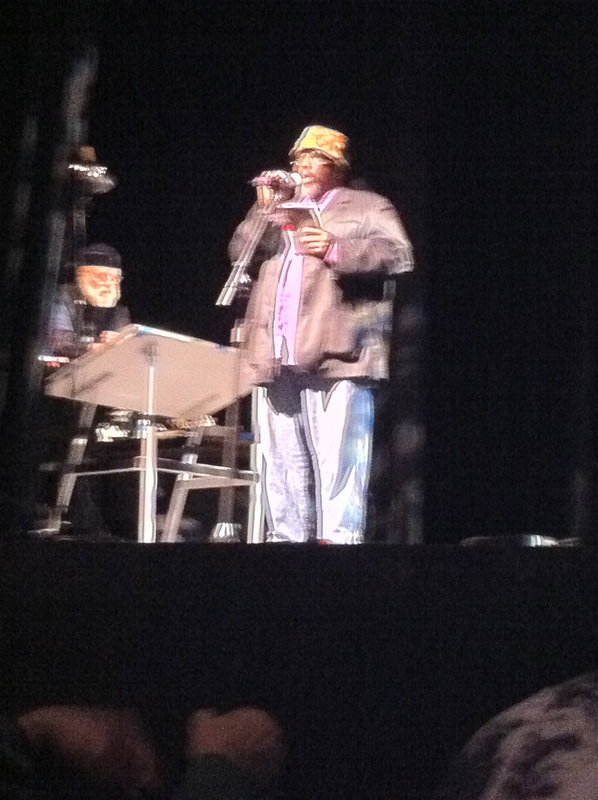 “This is a music that’s about love,” he told the audience. Love names the high risk this music wants to take. 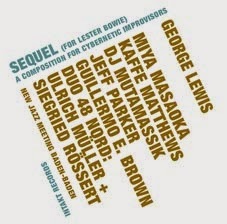 In the brief liner notes to the CD, Douglas writes that “improvisation transcends barriers between people and genres. 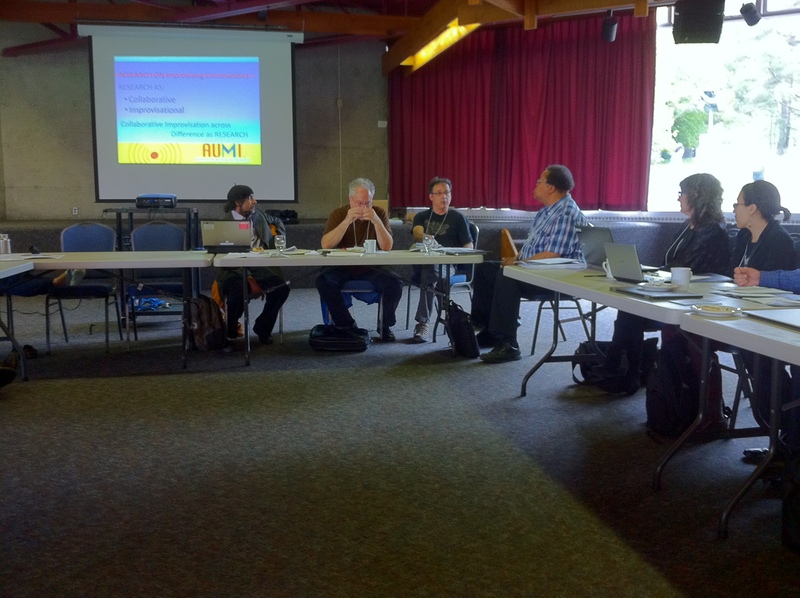 Improvisation models the way the world can work.” My colleagues and I in ICASP and IICSI have been thinking, and trying to produce various forms of practice-based research, along these exact lines. 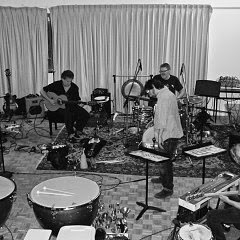 The improvised music of HIGH RISK offers one instance of a hugely successful, motivated and engaged co-creativity, laying the contingent and extemporaneous groundwork for a viable human community yet to come. Time of the Sign, the third album from the improvising collective Vertical Squirrels (and their second on Montreal’s Ambiances Magnétiques label), is a modest masterpiece, and ranks for me among the very best recordings of 2014. Vertical Squirrels formed as a quartet in 2008 in Guelph; its core members are faculty at the university there, three of them researchers with the Improvisation, Community and Social Practice (ICaSP) research initiative. Pianist Ajay Heble is the founder and (until this year) Artistic Director of the Guelph Jazz Festival, and his academic and curatorial work have brought him into close contact with some of the finest free improvisers in contemporary music. Guitarist Daniel Fischlinhas collaborated with Heble on key works in improvisation scholarship (including The Other Side of Nowhere [Wesleyan, 2004] and The Fierce Urgency of Now[Duke, 2013]) and is an eminent Shakespearean. Electric bassist Lewis Melville taught in the Department of Botany (now Molecular and Cell Biology), and the quartet’s original percussionist Rob Wallace was an ICaSP postdoctoral fellow. In the years leading up to the recording of Time of the Sign in June, 2012, Wallace moved on to other academic employment, and was replaced by drummer Ted Warren. By saying that there are no solos, I don’t mean to indicate as absence of melodic line or improvisational drive, but rather that this music emerges from simultaneous reciprocities, layers of polymorphic call-and-response but also of departures and excursuses that loop in and out of the general, generative flow. (The music was recorded live, open to the public, over the course of two days: the session announcement is still on Facebook.) The press kit, again, compares their music to some of the improvisational jams of Frank Zappa, and I can hear that, certainly, in their communal emphasis on rock ostinato, riff and groove. But I hear a collation of influences, closer at times to, say, Ornette Coleman’s Prime Time group around Virgin Beauty (1988) – without the insistently spiky harmolodic angles of the leader’s alto – or, at other moments, echoes of the audio-Americana of Lyle Mays and Pat Metheny. 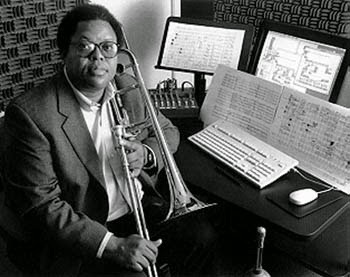 (Ted Warren’s electronically treated vocals on the title track closely recall Mark Ledford’s melodic doublings with the PMG.) The compiled electric pianos of Miles Davis’s In a Silent Way sometimes feel present, and the opening track, “Falling from the Ground Up,” recalls as it unfolds McCoy Tyner’s work from the early 1970s, while Lewis Melville basslines fall at several points into a Tinariwen-like pulse. None of these audible influences ever quite settles or takes hold for more than a minute or two, however, and what emerges as each cut builds is a buoyant, unstable and living audio organism, a porosity. Each time I listen, I hear new things, other textures: the shifting mesh, for instance, of Fischlin’s and Merritt’s guitars set against the phasing, metallic stringiness of Grossman’s hurdy-gurdy and Heble’s roiling and gangly piano makes for a rich differential polyphony. This music is essentially collaborative not because it demands agreement but because it honours co-creative multiplicity, a coming together apart, not to produce community in difference, not to overcome a plural and sometimes unruly lived humanity, but a community of differences, a soundscape that embraces and welcomes the open auditory field of the many, of disenclosure, of more. 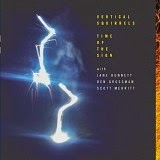 Time of the Sign is one of the great recordings of committed collective improvisation. Nicole Mitchell gave a keynote address at “Jazz, Race and Politics: A Colloquium” co-presented at the 2012 TD Vancouver International Jazz Festival by Coastal Jazz and the Improvisation, Community and Social Practice research initiative. Her talk was given the title “Afrofuturism Now,” but she ranged widely in her discussion of the cultural politics of African-American improvised musics, engaging with the work of Sun Ra and of Max Roach and Abbey Lincoln. She also explored in detail many of her own compositions and performances, and discussed her relationship to community and to heritage. She talks about her recent Xenogenesis Suite, which she composed as an homage to Octavia Butler. She also performed a brief flute solo (at about the 36 minute mark in the recording). 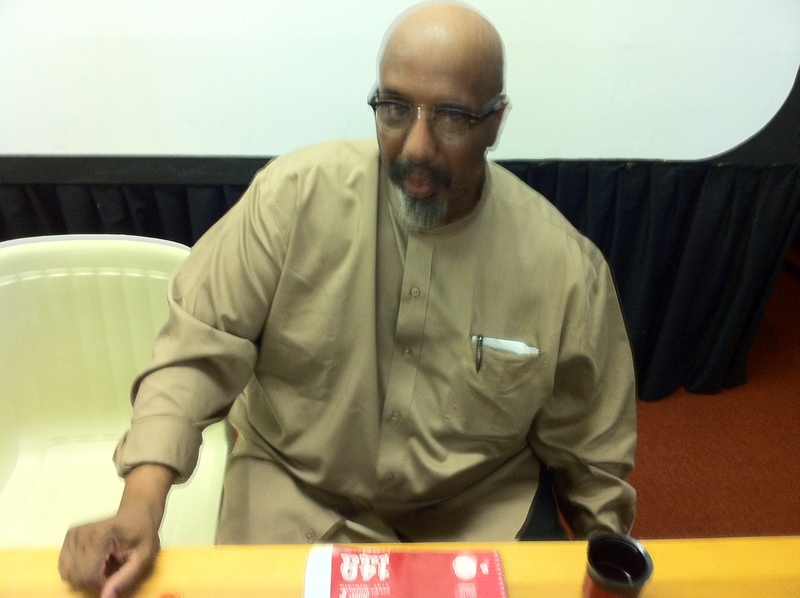 The audience for her talk included Ajay Heble, Tomeka Reid, Billy Hart and Billy Harper – Billy Harper can be heard asking questions and engaging in discussion with the audience at the end of the talk, as well. 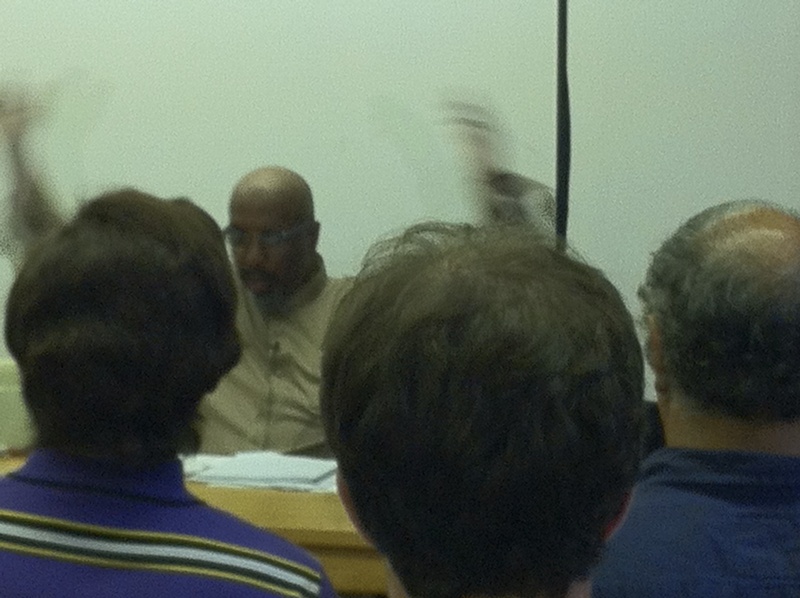 (He and Billy Hart were scheduled to engage in a panel discussion next.) I have edited out the audio examples from Max Roach and Abbey Lincoln, and from Sun Ra, but I have retained Nicole Mitchell’s own musical examples. I am the one who can be heard introducing the colloquium (with some references to the work of Stuart Hall and Wayde Compton) and also giving Nicole Mitchell a brief introduction. 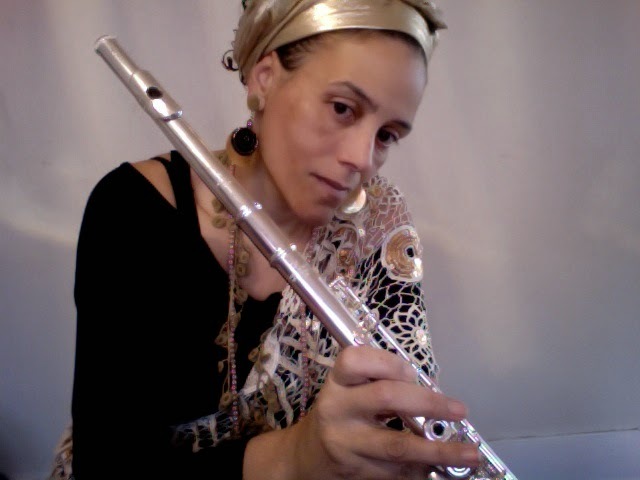 Copyright for the intellectual and creative material on this recording remains with Nicole Mitchell.